SKU:RB191850. 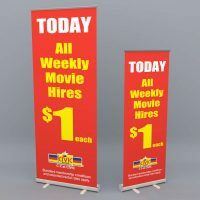 Categories: Deluxe Roll Up Banners, Exhibition Displays, Pull Up Banners, Tradeshows / Exhibitions / Events, Vinyl Banners and Tear Drop Banners Online Melbourne. Price Includes four colour process printing.